Molecular beacons are oligonucleotide probes that can report the presence of specific nucleic acids in homogenous solutions (Tyagi S, Kramer FR. Molecular beacons: probes that fluoresce upon hybridization, Nature Biotechnology 1996; 14: 303-308.) They are useful in situations where it is either not possible or desirable to isolate the probe-target hybrids from an excess of the hybridization probes, such as in real time monitoring of polymerase chain reactions in sealed tubes or in detection of RNAs within living cells. Molecular beacons are hairpin shaped molecules with an internally quenched fluorophore whose fluorescence is restored when they bind to a target nucleic acid (Figure 1). They are designed in such a way that the loop portion of the molecule is a probe sequence complementary to a target nucleic acid molecule. The stem is formed by the annealing of complementary arm sequences on the ends of the probe sequence. A fluorescent moiety is attached to the end of one arm and a quenching moiety is attached to the end of the other arm. The stem keeps these two moieties in close proximity to each other, causing the fluorescence of the fluorophore to be quenched by energy transfer. Since the quencher moiety is a non-fluorescent chromophore and emits the energy that it receives from the fluorophore as heat, the probe is unable to fluoresce. When the probe encounters a target molecule, it forms a hybrid that is longer and more stable than the stem and its rigidity and length preclude the simultaneous existence of the stem hybrid. Thus, the molecular beacon undergoes a spontaneous conformational reorganization that forces the stem apart, and causes the fluorophore and the quencher to move away from each other, leading to the restoration of fluorescence. Figure 1. 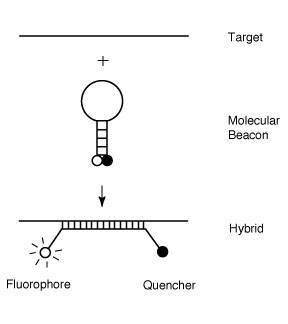 Operation of molecular beacons. On their own, these molecules are non-fluorescent, because the stem hybrid keeps the fluorophore close to the quencher. When the probe sequence in the loop hybridizes to its target, forming a rigid double helix, a conformational reorganization occurs that separates the quencher from the fluorophore, restoring fluorescence. In order to detect multiple targets in the same solution, molecular beacons can be made in many different colors utilizing a broad range of fluorophores (Tyagi S, Bratu DP, Kramer FR. Multicolor molecular beacons for allele discrimination, Nature Biotechnology 1998; 16: 49-53.) DABCYL a non-fluorescent chromophore, serves as the universal quencher for any fluorophore in molecular beacons. Owing to their stem, the recognition of targets by molecular beacons is so specific that single-nucleotide differences can be readily detected. The underlined sequence at the 5' and 3' ends identifies the arm sequences that are complementary. 1. Determine the fluorescence (Fbuffer) of 200 μl of molecular beacon buffer solution using 491 nm as the excitation wavelength and 515 as the emission wavelength. If the fluorophore is not fluorescein, chose wavelengths that are optimal for the fluorophore in the molecular beacon. 2. Add 10 μl of 1 μM molecular beacon to this solution and record the new level of fluorescence (Fclose). 3. Add a two-fold molar excess of the oligonucleotide target and monitor the rise in fluorescence until it reaches a stable level (Fopen). 4. Calculate the signal to background ratio as (Fopen-Fbuffer)/(Fclose-Fbuffer). 1. Prepare two tubes containing 50 μl of 200 nM molecular beacon dissolved in 3.5 mM MgCl2 and 10 mM Tris-HCl, pH 8.0 and add the oligonucleotide target to one of the tubes at a final concentration of 400 nM. 2. Determine the fluorescence of each solution as a function of temperature using a thermal cycler with the capacity to monitor fluorescence. Decrease the temperature of these tubes from 80 ℃ to 10 ℃ in 1 ℃ steps, with each hold lasting one min, while monitoring the fluorescence during each hold. Utilize molecular beacons that are complementary to a sequence in the middle of the expected amplicon. The length of their arm sequences should be chosen so that a stem is formed at the annealing temperature of the polymerase chain reaction. The length of the loop sequence should be chosen so that the probe-target hybrid is stable at the annealing temperature. Whether a molecular beacon actually exhibits these designed features is determined by obtaining thermal denaturation profiles. The molecular beacons with appropriate thermal denaturation characteristics are included in each reaction at a concentration similar to the concentration of the primers. During the denaturation step, the molecular beacons assume a random coil configuration and fluoresce. As the temperature is lowered to allow annealing of the primers, stem hybrids form rapidly, preventing fluorescence. However, at the annealing temperature, molecular beacons also bind to the amplicons and generate fluorescence. When the temperature is raised to allow primer extension, the molecular beacons dissociate from their targets and do not interfere with polymerization. A new hybridization takes place in the annealing step of every cycle, and the intensity of the resulting fluorescence indicates the amount of accumulated amplicon. 1. Set up six 50 μl reactions so that each contains a different number of targets, 0.34 μM molecular beacon, 1 μM of each primer, 2.5 units of Amplitaq Gold DNA polymerase (Perkin Elmer), 0.25 mM of each deoxyribonucleotide, 3.5 mM MgCl2, 50 mM KCl, and 10 mM Tris-HCl, pH 8.0. 2. Program the thermal cycler to incubate the tubes at 95 ℃ for 10 min to activate Amplitaq Gold DNA polymerase, followed by 40 cycles of 30 sec at 95 ℃, 60 sec at 50 ℃ and 30 sec at 72 ℃. Monitor fluorescence during the 50 ℃ annealing steps. The assay medium may contain insufficient salt. There should be at least 1 mM MgCl2 in the solution, in order to ensure that the stem hybrid forms. The molecular beacon may fold into an alternate conformation that results in a sub-population that is not quenched well. Change the stem sequence (and probe sequence, if necessary) to eliminate that possibility. Incomplete restoration of fluorescence at low temperatures. the stem of a molecular beacon is too strong, at low temperatures it may remain closed while the probe is bound to the target. This may happen inadvertently if the probe sequence can participate in the formation of a hairpin that results in a stem longer and stronger than originally designed. Change the sequence at the edges of the probe and the stem sequence to avoid this problem.